Every seven seconds someone is injured in a car accident. Distracted driving is involved in about 40 crashes every day in Colorado. You are 20 times more likely to get in a crash if you are texting while driving and one in 10 people admit to driving while distracted. These facts showcase a dark trend for safety on the roads. And if safety isn’t enough, rising insurance premiums should get the attention of Colorado residents. 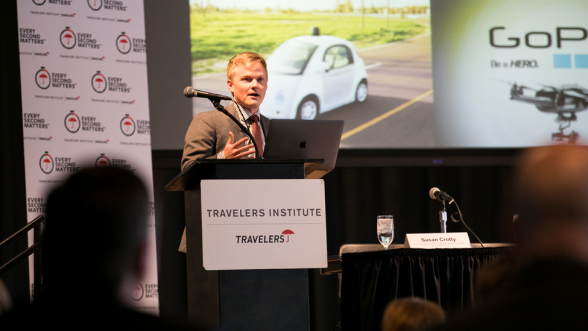 Travelers Insurance selected the CU Denver Risk Management and Insurance (RMI) program as one of three university campuses nationwide to host the Travelers Institute Public Service Every Second Matters Distracted Driving symposium. A crowd of 200 industry professionals and students attended the April 2 symposium in the Tivoli Turnhall. Travelers’ initiative focuses on the need to reduce distraction-related roadway fatalities and injuries. “We created this initiative to help change perceptions about this problem so people start taking it seriously,” Woodward said. At the event, Travelers shared their 2018 Travelers Risk Index, which highlighted statistics on distracted driving and the perception of risk among drivers and passengers. At first glance, the stats are pretty scary. More than 37,000 Americans died on US roads in 2016. Consistent with previous years, an overwhelming majority of people surveyed said that distracted driving is a concern. Eighty-five percent said it is extremely risky to use smartphones or tablets while driving, yet nearly a quarter of respondents said they do it. Sixty-one percent of those who use their phones while driving do so because they worry about a possible emergency, and 23 percent do so because they’re scared of missing out on something important, even though they know their actions are distracting to driving. Here in Colorado insurance rates have increased 12 percent in 2017, which places the state as third in the nation for rising car insurance premiums. Colorado insurance rates have been tumultuous. Rates have doubled in the last two years nationwide and are up six percent nationally. Here in Colorado insurance rates have increased 12 percent in 2017, which places the state as third in the nation for rising car insurance premiums. When polled, Coloradans know this is a big problem. 88 percent support a texting while driving ban, but legislators cannot pass a bill. “This is an election year, but politics make it tough to pass laws the majority of citizens want,” shared Carole Walker, RMIIA Executive Director. There’s a problem. What’s the solution? If you’re a passenger, it’s as simple as speaking up. For parents, it’s important to keep in mind that your children mimic you so setting a good example is even more important. The statistics highlight that drivers age 24 through 31 are a key market to educate. Research shows that 30 percent of these drivers say texting has no impact on their driving. Events like the one Travelers puts on are a great way to raise awareness. However, many people see technology as the future. “Technology got us into this mess, technology can help us get out of it,” shared Sam Cole, Communications Manager, Colorado Department of Transportation (CDOT). Could self-driving cars be our solution? Christoffer Heckman, keynote speaker and assistant professor at CU Boulder, spoke on possible solutions to this massive problem facing us. He first spoke to one of the hottest topics in this industry: autonomous vehicles. He shared that the biggest challenge ahead for this kind of driving technology is getting that technology to understand and react to the environment around us. As it stands, autonomous vehicles aren’t there yet. Since we are still awaiting self-driving car technology to catch up, people are looking at other solutions to fix this problem. One idea is to look at the safety features of older and newer models and how to integrate this new technology. Unfortunately, the average age of cars on the road is 11 years old. Older cars do not have the newer safety technology, such as Forward Collision Warning, Lane Departure Warning, and Blind Spot Warning. It’s estimated that these three existing options alone could save 10,000 lives a year. It’s estimated that these three existing options alone could save 10,000 lives a year. Telematics is the technology of tracking information for vehicles on the move through GPS and mobile devices. CDOT has a list of apps to download that help reduce distracted driving incidents. Heckman also discussed telematic solutions like ‘Do Not Disturb’ apps, as well as the Mojo App, which gamefies safe driving. This app incentivizes drivers for not touching their phones while driving, rewarding them with points for cash and prizes. Prior to the symposium, Travelers hosted an exclusive networking reception for RMI students to meet with Travelers Young Professionals and recruiters to network and discuss internship and career opportunities. RMI alumni Monica Hanulik and Michael Wilson attended and represented as Travelers Young Professionals executives. The CU Denver Gamma Iota Sigma (GIS) Beta Mu chapter officers organized a group of current RMI and GIS students to participate in the networking event. David Adugna, president of GIS Beta Mu, is taking his experience with Travelers a step further through another unique opportunity provided by the RMI program. “I made amazing connecting at the event with alumni, professors, and business leaders and I am doing a Shadow Day at Travelers next week,” shared Adugna. At Shadow Day, he will interact with executives and learn more what it’s like to work in the company on a day-to-day basis. In the aftermath of recent financial and natural crises, the difference between success and failure for a company increasingly depends on a firm’s ability to effectively manage risk to enhance firm value. That’s why the CU Denver Risk Management and Insurance program was born. Because of a rapidly shrinking workforce in the industry, the industry connected with CU Denver to build a program that can successfully develop new talent for the industry. With a 100 percent placement rate, the RMI program gives graduates opportunities like this Travelers event to network and ultimately find jobs.